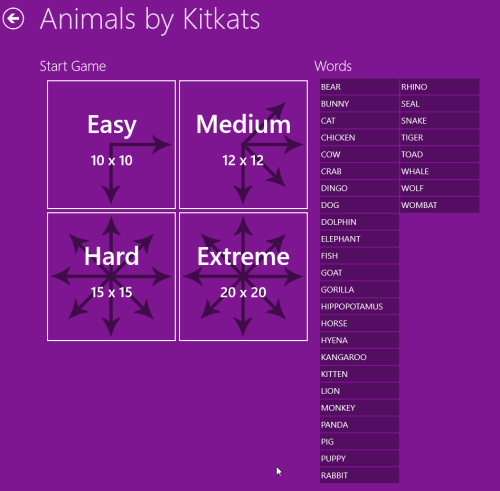 Word Search Party App for Windows 8 is a fun game that helps in polishing your brain. It is a free puzzle game for Windows 8 that can be easily located in ‘Games / Puzzle’ section of Windows 8 app store. This Word Search Party Windows 8 app utilizes more that 8000 word lists to generate unique puzzles. It means that fun never ends at Word Search Party app for Windows 8. The puzzles have been divided across 30 categories and you can choose ones matching with your interest. The top among them are TV & Movies, Music, Travel, Spelling Lists, Lifestyle, Sports, and Science. In addition, you can also create your own custom puzzles as well. 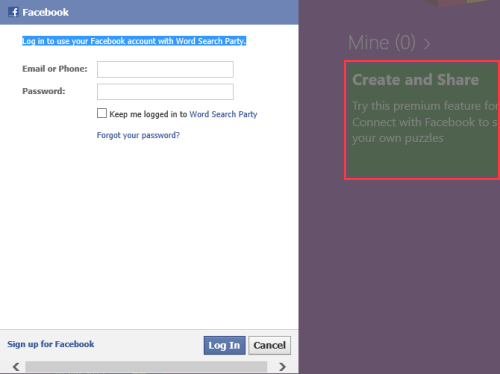 On launching the puzzle game Windows 8 app, you will be presented a window with multiple links to puzzles under different categories. Click on any button grabbing your attention. On doing so, you will be presented a new window for selecting the desired difficulty level. The game supports three difficulty levels; easy, medium, hard, and extreme. Have a look on arrows in screenshot above to get an idea about the manner in which the combinations will be presented to you. I opted for the easy. Here, you require dragging pointer on letters to make complete words that are displayed in the list to the right section. On the top-right section will be a timer displaying the time spent. Your task will be to find all words in minimum time. Also, check out our posts on Jigsaw Puzzle Apps, Sudoku Puzzle Apps, and Word Game Apps. On the home screen exists a green button stating ‘Create’; click on it and then, you will be prompted to perform Facebook login and authorize application to access your information. After successful authorization, you will be presented following interface for creating your own puzzle. You need specifying title for the new puzzle to be created. Then, type the words in the adjacent textbox. It must be noted that you will only be able to enter words without spaces. Type the word and hit enter button and it will appear below. Finally, click on ‘Save Puzzle’ button. Now, you can start playing your very own version of puzzle. To install Word Search Party App for Windows 8 you will require opening this link in supported web browser such as internet explorer 10 or later. Next, click on ‘View in Windows Store’ button followed by a click on ‘Install’ button. 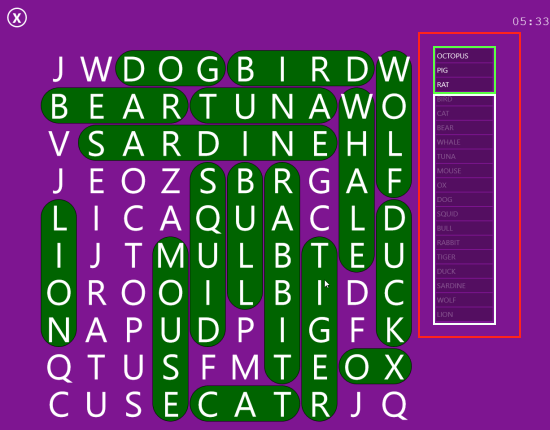 Word Search Party App For Windows 8 is a nice option to try when you have some time to kill.